Whether you take it as a snack, your preferred drink in the morning, or as part of your salad, oranges are definitely one of the easiest fruits to eat. They also have tons of health benefits, like providing energy and making you resistant to illnesses like coughs and the common colds. Oranges make for a great addition to any meal. Add to that the fact that they are highly concentrated with vitamin C, you now have a super food that can do your body wonders. It doesn’t hurt that they taste really good, too. Oranges are proven to be effective in fighting certain cancers, including the mouth, skin, breast, stomach, and colon varieties. Thanks to a compound called citrus limonoid, oranges also lower cholesterol, which is a risk factor for heart disease and other health problems. Oranges can help prevent the formation of kidney stones. Drinking orange juice, according to a study published in the British Journal of Nutrition showed that women who drank one half to one liter of orange juice increased their urinary pH value and diminished the risk of forming stones. Likewise, a daily dose of orange can help ward off ulcers, according to another study. 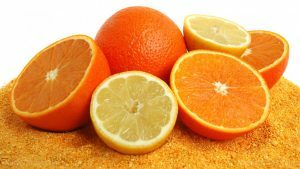 Data from more than 6,000 adults showed that those with the most levels of vitamin C experienced a 25 percent lower incidence for infection with the bacterium that causes peptic ulcers. The said infection can lead to stomach cancer. Furthermore, oranges can help prevent lung cancer. Oranges contain beta-cryptoxanthin, a carotenoid that has been shown to reduce the risk of this cancer by 27 percent based on a 2003 study published in Cancer Epidemiology, Biomarkers and Prevention. Eating oranges regularly can also keep you safe from colon cancer because of the high fiber found in the fruit. Speaking of fiber content, oranges can effectively aid in preventing atherosclerosis. You can keep blood sugar levels controlled and treat constipation and diarrhea. Interestingly, even the peels of an orange can do your body wonders. A certain class of compounds called polymethoxylated flavones (PMFs) is believed to have the ability to lower cholesterol more effectively than prescription drugs. The good news is, they won’t even have any side effect. Moreover, including oranges in your diet can protect you against rheumatoid arthritis. Research has shown that drinking freshly squeezed orange juice daily can significantly decrease the risk of developing this condition. In the same way we enjoy oranges in different ways, these well-loved citrus fruits help so many different body systems: digestive, respiratory, reproductive, eyes, adrenal glands, liver, and connective tissues. Phytonurients present in oranges are great for blood pressure. You can be assured that with each slice of orange you consume, you’re doing your heart good. It also makes your body stronger in fighting inflammation and preventing cell damage. Regular consumption will also give your body enough fiber to help with the digestive tract. You can treat constipation and ensure healthy passing of stool. The same fiber will help you achieve a healthy cholesterol level. Packed with vitamin C, oranges are great for boosting immunity. Your body will be able to fight cell damage, which is basically the start of all health problems. You can fight infections and achieve healthy, beautiful skin. Furthermore, oranges are great for alkalizing the body. Just like lemons, these help balance the pH level of your system, which can make you more resistant to illnesses. Oranges are savory and very easy to prepare. That’s why there’s plenty of ways to enjoy them. You can eat them raw or add to salads. You can make smoothies or shakes. You can even add them on pastries or certain dishes. If you’re looking for easy-to-make orange recipes, check these out. Oranges can keep skin looking healthy. Oranges promote a healthy heart. Oranges can prevent certain types of cancers. Oranges prevent the formation of kidney stones. Oranges keep bones strong and healthy.